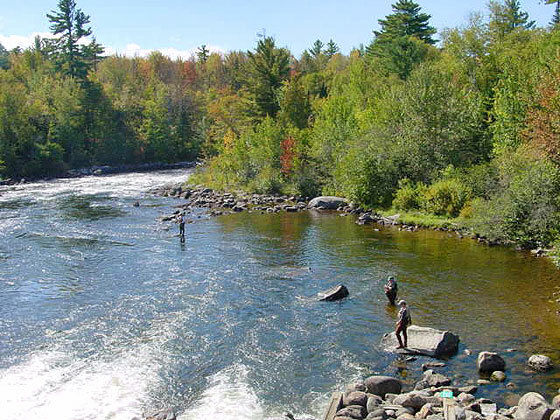 Upper Dam on Mooselookmeguntic Lake is a popular fly fishing spot. Registered Maine Guides and Master Maine Guides are experienced, certified professionals who offer their expertise and guiding services to vacationers and visitors to the state. Services are usually available on a half day, full day or per trip basis. Many specialize in a particular sport or recreational activity. Recreational Maine guides offer boat tours, canoeing, rafting, kayaking, hiking, mountain biking, horseback riding, nature & photography tours, moose watching safaris, cross country skiing, snowshoeing, and ski joring trips, downhill ski lessons, and backcountry snowmobile tours. I am looking for a picture of a gentleman who was a Maine Guide in the Rangeley area in the 1960’s. Can you help? Thank you.